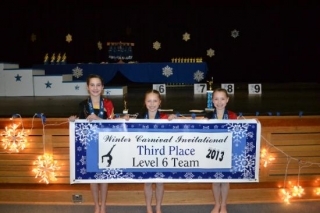 ELLSWORTH — A Level 6 trio from Springers’ Gymnastics Center placed third and a Level 5 gymnast won was a floor exercise champion at the 17th annual Winter Carnival in Stratham, N.H., last weekend. It was the first outing of the USA Gymnastics League season for the seven Springers’ gymnasts. Highlights for the Ellsworth area girls included Madelyn Nida’s first place performance in the floor exercise at Level 5. Nida also placed fourth on the vault and beam and ninth on bars to finish fourth all-around. 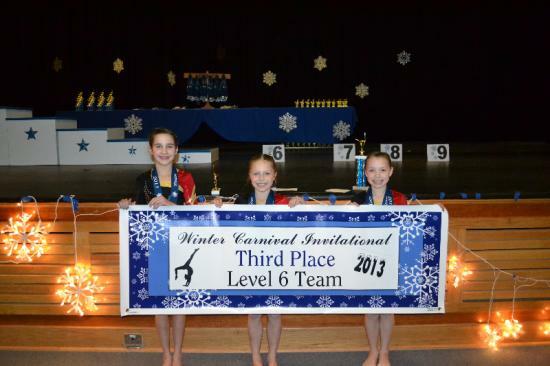 On the third place Level 6 team were Katherine McKee, Paige Sawyer and Sarah Danby. Katherine was second on the floor third on the vault, fifth on the beam and sixth on the bars for second all-around. Paige was third on the floor, fifth on the vault and seventh on the bars and beam for fifth all-around. Sarah was third on the bars, eighth on the beam and sixth all-around. Also at Level 5, Gilly Rice was second on bars, third on floor and fourth all-around, and at Level 4, Riley Crowley was sixth on beam and floor. The meet was hosted by Gymnastics at Brentwood Commons. “There is really only one way to get experience in competing in big meets and that is to go to them,” said Springer. The larger Down East Family YMCA team from Springers’ will be competing this weekend in Bangor, and another USA Gymnastics event is scheduled in Biddeford Jan. 26 and 27.